1) This isn’t exactly the use for smoking jackets we imagined, but kudos to the owner of this French café for creativity. 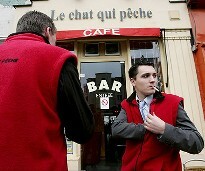 To combat France’s unjust smoking ban, which went into effect on January 1, he has a number of fleece jackets – technically vests – on hand for his customers so they don’t freeze when they’re forced to go outside for a smoke. 2) As in France, the good people of Alaska are being forced out into the cold by a tyrannical smoking ban. Anti-tobacco advocates say they passed the law out of health concerns, but are they going to apologize when when someone catches pneumonia and dies, as happened in Toronto last winter? 3) Around the Blogs: Cigar Inspector inspects the Carlos Toraño Exodus Silver. Stogie Review reviews the Partagas 160. Keepers of the Flame lights up an EO 601 Green Label. Cigar Monkey smokes the Carlos Toraño Signature. 4) Deal of the Week: Once again our deal of the week is a fantastic sampler from Tinderbox.com. You’ll get ten sticks from big name cigar makers like Cohiba, Montecristo, H. Upmann, and Arturo Fuente for just $29.99! Grab yours here.